The central thread of Edgar Allan Poe's 1841 short story Murders in the Rue Morgue is one of mystery. Two bodies are found, so degraded that investigators can only imagine a killer with a "grotesquerie in horror absolutely alien from humanity". Poe's novel is cerebral, focusing on analytical observation and the calculating power of the mind. It laid the groundwork for Arthur Conan Doyle's great detective and moved police work into the 20th century. Robert Florey's film adaptation however, holds no such aspirations. Here acumen is replaced by something more visceral and focus shifts to themes of desire, rage and revenge. This is after all the cinema, and here emotion is king. The portrayal of Mirakle as a bloodthirsty Darwinist (more interested in the pursuit of knowledge than human life) may seem like an animadversion against science, but this is not the film's agenda. The heroic Dupin is also a man of learning and uses, in a nod to Poe, forensic examination to prove his adversary's guilt (his loft dwelling is full of test tubes, beakers and microscopes, "making a morgue out of our home" as his flatmate bemoans). These erudite leanings are secondary to the films main preoccupations and Florey and his screenwriters (including an uncredited John Huston) merely use this as a lynchpin upon which to hang the narrative. The head here is merely a plot device; the heart is where the real blood flows from. In the sideshow opening, it is desire that most engages our characters. Both Dupin and his roommate lust after the Arabian snake dancer ("come, we must continue our studies of anatomy") and it is here that Mirakle first lays eyes on Camille. For 1932 the film is surprisingly sexualized, with Camille later seen laying prostrate, breathing excitedly in her lover's arms. This being a horror film however, this soon becomes dystopic. In a scene that disturbed censors of the time, Lugosi - those penetrating eyes moving out of the fog - uses a sadomasochistic rack to chain up a prostitute and administer the needle. To Mirakle's dismay her "blood is rotten, black as your sins!" and his rage leaves her dead, her body dumped in the river where only the city's disposed lament her passing. Indeed, this vehemence runs rampant throughout the city. Sailors jealously fight over a girl (knifing each other in the process) and Mirakle is finally undone by Erik's fervent protection of Camille and his revenge for her mistreatment. For all his scientific posturing Dupin revels in this. "Think of what these walls are hiding," he muses. "Broken hopes, bodies and hearts...crimes of the street and tragedies of the river. Paris -- my city". This is spoken with a kind of pride and Florey's characters, even the most learned, all delight in this madness. The film ends with another broken body sent to the morgue, to which the coroner can't help but give a little chuckle. In Florey's world death is always the final resting place for emotion and both Charles Hall's production design and Karl Freund's cinematography reflect this jagged hysteria. Borrowing heavily from European Expressionism (particularly Robert Weine's The Cabinet of Doctor Caligari, from which Rue Morgue also borrows characters and a rooftop finale) we see buildings lean out over long dirty streets, agitated roofs and chimneys, distorted black shadows that hack up the frame. The morgue itself is a composition of wooden beams and a huge cross looking down in judgment. Like all expressionist art this world is a deep reflection of its inhabitant's inner state - and here that state is despair. This then, is not the clinical examination of Poe's original story. Florey's Murders in the Rue Morgue is hot blooded and filled with psychosis and fits of rage. Lugosi (then still on everyone's minds as Dracula) again brings with him that perverse sexuality, and it is here better suited than before. And while the film veers far away from its source, in the process it becomes a new beast, equally as dangerous, but far more enticing. Submitted by Joe Barlow (not verified) on Mon, 2011-03-21 07:51. This is one of those noir-tinged horror movies that doesn't quite work. Although Karl Freund's cinematography is exquisite, this movie simply feels half-baked. I've never been a big fan of the central premise (which is the result of the Poe source material), but apart from Freund, it doesn't feel like anyone involved in the film really cared about what they were doing. As always, your mileage may vary. I enjoyed your insightful write-up. Submitted by nvadr on Sat, 2011-03-26 19:52. Lugosi the Epitome of the Stage & Screen Professional.. One of my favorite Bogeymen from the Universal horror classics era. Murders in the Rue Morgue from my understanding had been cut quite drastically from 80 minutes to 61 due to disturbing scenes which might be considered offensive. Granted this is a Pre-Code film, executives still feared backlash from morality groups. 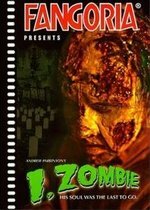 This film was a box office disappointment and Universal refused to renew Lugosi's one year contract, with Rue Morgue being compensation for being removed from the production of Frankenstein. 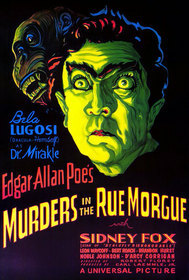 Murders in the Rue Morgue is a very dark & disturbing film that does the Poe novel justice & today is considered another horror classic that just keeps getting better over time. Submitted by Anonymous (not verified) on Sun, 2011-04-03 23:53. I just think it was like doing The Hound of the Baskervilles without Sherlock holmes. Submitted by Top 100 Scary Movies (not verified) on Sat, 2011-04-16 14:03. Submitted by gary dobbs (not verified) on Mon, 2011-04-25 04:32.